In this series, I will compare Bobby Jindal’s pledges as a candidate in 2007 with his record in the Governor’s office. 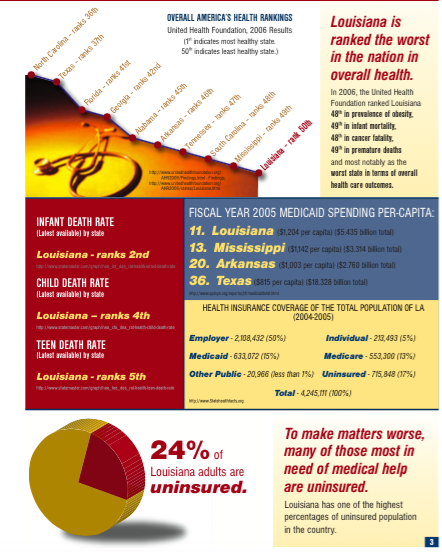 I began with the centerpiece of Jindal’s 2007 campaign, ethics reform, and today, I will be unpacking his 2007 campaign pledge for health care reform and compare it with his current stance against the Affordable Care Act. “We must also maximize opportunities to attract federal investment in our (health care) system.” – Bobby Jindal, candidate for Louisiana Governor, 2007. Bobby Jindal, at the age of 26, catapulted into top echelon of Louisiana government, becoming the youngest-ever Secretary of the Department of Health and Hospitals (DHH). He has always been considered a health care policy wonk, a wunderkind, and as the story goes, he earned his appointment to the DHH based largely on the strength of a white paper he wrote for a large consulting firm shortly after college. Following his stints in the capitol in Baton Rouge and then as President of the University of Louisiana system, Jindal worked on a bipartisan Presidential commission charged with making recommendations to reform Medicare. When he ran for governor in 2007, then Rep. Jindal published a policy paper outlining his vision for reform. We should also allow individuals and small businesses to pool their health insurance purchasing power to get lower rates. Creation of a health insurance “exchange” would establish a “market organizer” that could serve as a central system for buying and selling insurance. Any resident of Louisiana would be eligible to purchase insurance through that exchange, whether as an individual or as an employee of a small business. This insurance would be a portable asset for the patient. The health care exchange would, in effect, facilitate a uniform withholding system allowing couples, for example, to combine contributions from two employers to buy coverage. The central exchange mechanism could alleviate administrative burdens for small businesses that offer group coverage by allowing employers to designate the exchange as a group insurance plan. Louisiana must do a better job of attracting federal and corporate research and development investments in the health care sector where we already have substantial assets. Louisiana is 49th amongst states in attracting industry investment in research and development and 36th amongst states in federal research dollars. His pitch was convincing and practical: Allowing individuals and businesses to participate in health insurance exchanges and to purchase portable, private-sector plans was a principled, market-based solution. But in order for it to work, in order to drive down costs enough to guarantee these exchanges would be affordable, the risks need to be spread out as broadly as possible. That, as almost everyone understood at the time, required mandating health insurance, just as Mitt Romney had done in Massachusetts. Otherwise, the marketplace collapses. To be sure, Jindal stopped short of explicitly championing the individual mandate, and although he may dispute the characterization, the individual mandate was absolutely essential- foundational- to the policy he promoted. Voters also understood the need to attract more federal spending on health care in Louisiana. The state’s health outcomes and rankings were abysmal. Despite the state’s surplus of natural resources, it remains one of the poorest in the country, which, unsurprisingly, means that its public, charity health care system eats up an enormous part of the budget. If Louisiana attracted more federal dollars for health care, it could potentially free up money needed for other programs, projects, and services. Two years after he was sworn in as governor, Bobby Jindal received what he should have treated like manna from heaven, the Patient Protection and Affordable Care Act, also known as the ACA, also known as Obamacare. Under the ACA, Governor Jindal, not the President, would get to build those state health insurance exchanges he envisioned for the people of Louisiana. It’d probably require some glad-handing and more than a few dinners with insurance companies, but as other states have demonstrated, it could be done. Perhaps even more importantly, Obamacare would provide Louisiana with a staggering $17 billion over the next decade. More than 250,000 working class citizens could now, for the first time in their lives, access health insurance. Thousands and thousands of jobs would be created all across the state. Emergency rooms would be modernized and expanded, along with hospitals, nursing homes, clinics, and social service agencies. But Bobby Jindal rejected all of it, and that, in my opinion, was the worst, most cataclysmic, and cynically dishonest decision in modern Louisiana history. He based his decision on bogus projections from his own staff’s and consultant’s cherry-picked and thoroughly repudiated report, declaring that Medicaid expansion in Louisiana would somehow result financial ruin. Last week, after Governor Jindal forced the closure of an emergency room in Baton Rouge, my friends at the satirical website The Red Shtick, published an article titled, “Governor Bobby Jindal on BR General ER Closing: ‘Maybe Poor People Should Take Better Care Of Themselves.‘” It fooled almost everyone, including Jindal supporters who wrote in to express their agreement, a well-known college professor who was livid, and the former Communications Director for the Democratic National Committee. But not just because the quote seemed outrageous, which it did; it fooled folks because it seemed entirely probable. If ordinary readers can’t differentiate between satire and the facts, it’s probably because the truth is often stranger than fiction. Excellent job of laying this whole story out! Being a former US Marine/Vietnam war vet, I have o “polite” words to describe lil’ Booby Jindal. That he has done such a damn foolish thing as to reject these Federal funds is beyond belief. He basically rejected what he once was for. This shows he has zero principles that he will stand up for, ever. Gutless little coward who only cares about the top 1% of the very rich. Excellent reporting, as ever. This is yet more proof that piyush is totally unable to govern and in fact, has zero job skills. Too bad so many people are just waking up to the reality that he is a complete fraud, and toxic as well. Louisiana will be paying for his malfeasance for decades. He should be criminally prosecuted for malfeasance and payroll fraud.